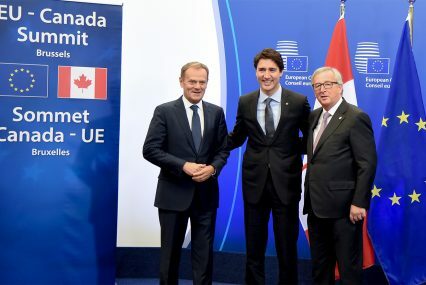 The European Union and Canada signed a landmark Comprehensive Economic and Trade Agreement (CETA) this week after seven years of negotiations and weeks of on-off final talks between EU members. CETA was saved at the eleventh hour after the Wallonia region of Belgium, having deadlocked the deal, came to a compromise with its federal government allowing it to sign up to the pact. However, the agreement came too late for the original signing ceremony which had been set for October 28. Canadian prime minister Justin Trudeau finally made an arrival in Brussels on October 30 instead, after even his flight, which faced mechanical issues on the way, pushed back the signing by a further few hours. “There were many voices heard. There were concerns raised, concerns addressed. And every step demonstrated that trade agreements can be good for everyone. That we can create inclusive growth and we can benefit the middle-class workers through opening up markets and creating greater access to goods,” said Trudeau after the signing. CETA will remove over 99% of tariffs on trade between the EU and Canada and is expected to boost trade between the two by €12bn a year as well as generating growth and new jobs on both sides of the Atlantic. Opposition to the deal, and similar ones like the Transatlantic Trade and Investment Partnership (TTIP), has been growing among public and professional bodies, who argue that these deals will hinder standards on products and markets as well as on climate policies adopted in the EU. One major sticking point to the deal has been the inclusion of the investor-state dispute settlement (ISDS) mechanism, which will allow companies to sue countries over any new law or policy that they consider to be discriminatory towards their investments. Previously, such investment agreements have been negotiated bilaterally – not at EU level. “The ISDS issue has been one of the primary drivers of growing concerted opposition to CETA, TTIP and the wider EU FTA agenda. It is fair to assume that carving out investor protection chapters from FTA negotiations would make the latter far less contentious,” Daniel Capparelli of advisory firm Global Counsel tells GTR. CETA will now enter a process of formal ratification which, according to the European Parliament, will take between two to four years. In reality this could be a lot longer, with the possibility that it still may not happen at all.